I've lived near the South West coast for most of my life and was brought up with stark warnings about not walking out onto the mudflats. The mudflats are the exposed area between the shoreline and the sea which, most of the time, seems to be about five miles out from the shore. This is how Weston got its nickname; Weston-Super-Mud! Every year, the coastguard rescues groups of people who have ignored the warnings and ended up stuck in the sticky sinking mud. 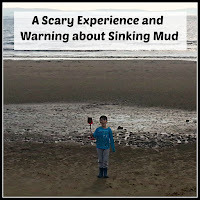 However, when L encountered the sinking mud, it was close to shore and indistinguishable from the usual puddles you get when the tide goes out, or it has rained a little. 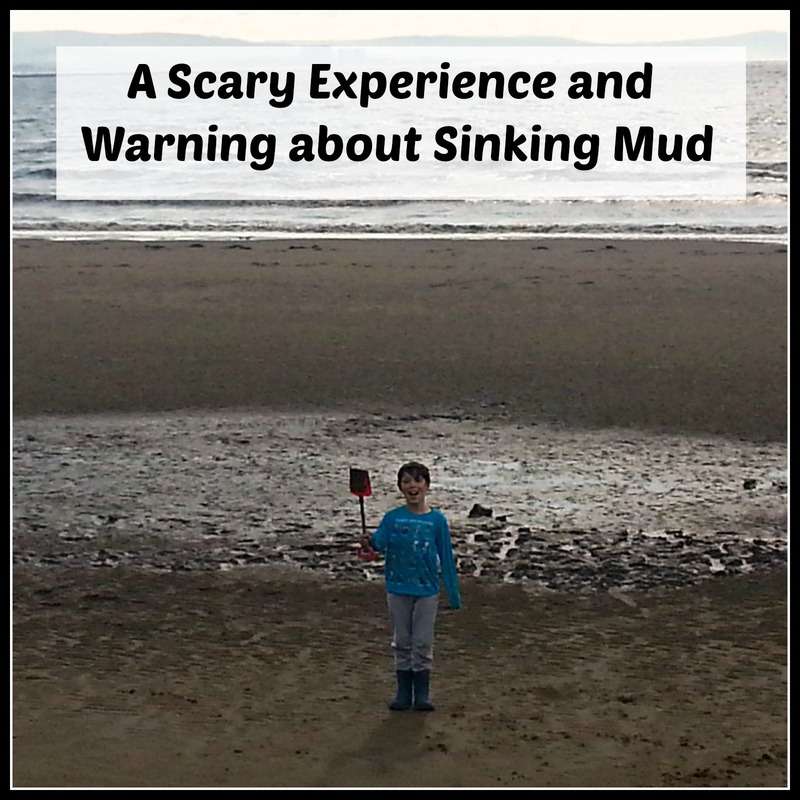 The mud is really dangerous, as you can end up hypothermic from standing still for so long if you get stuck, and from the tide coming in, while you're stuck there, which could be fatal. So, we always stay close to the shore, and leave the sea where it is, in the distance. On Friday, though, we took L to Burnham-on-Sea, just along the coast from Weston, to spend a little time on the beach. 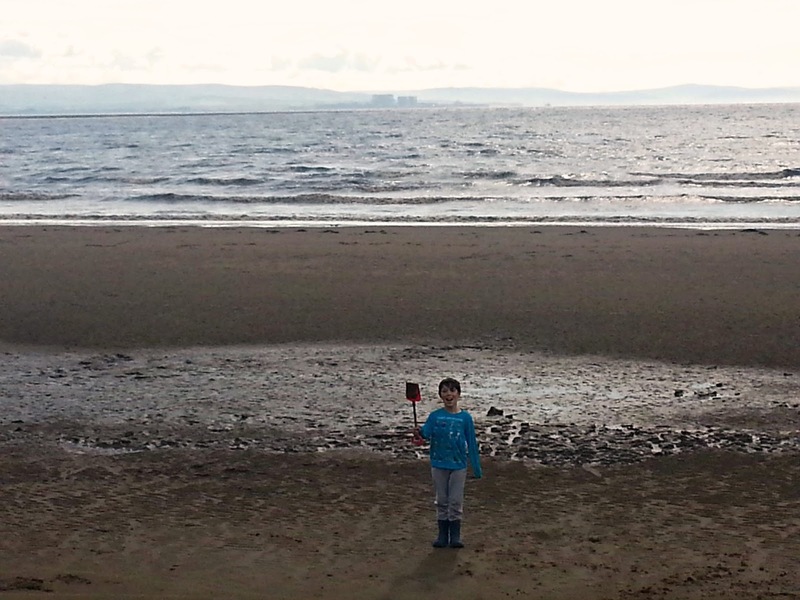 It had been raining that day, but the sun had come out and everything had dried out a little, so off he went with his bucket and spade. In the photo, you can see some of the vast expanse of normal beach sand, but, just behind him, was a relatively small patch of, what looked like, wet sand. However, when he started to walk across it, he instantly sank below his knees. Despite the heavy mud sucking him in, he managed to get back to safety, thanks to his sister's quick actions. He was forced to leave his wellies in the mud, which I think helped him escape when she pulled him out. It was obvious, if she hadn't been there, he could not have got out on his own. As he was completely covered in thick mud and pretty shaken, we just had to go home. This was a minor inconvenience though, compared to what could have happened. It was really scary and I couldn't help thinking that, had he been a bit shorter, gone across a bit further, or hadn't had someone close by to help, this situation could have been a lot more serious. He could have sunk further down, and it would have taken a lot longer to get him out, causng more distress and increasing the risk of injury. I feel a bit silly, having visited these beaches for so many years, but I wanted to take the opportunity to warn others. 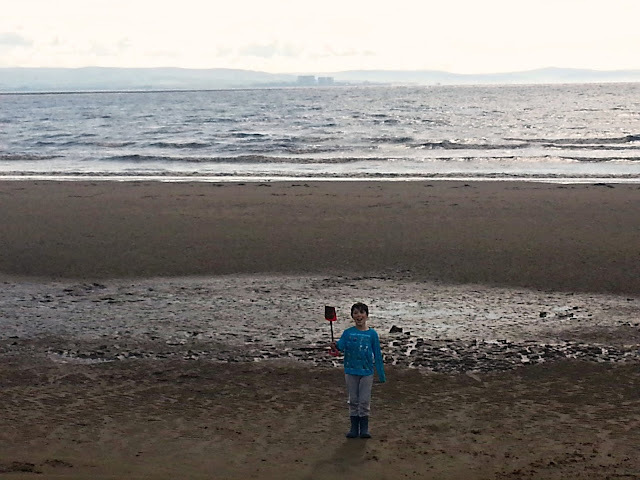 Please be aware of any puddles, or wet sand close to the shore, they could be more dangerous than they look. I'm so glad he was able to get to safety. I've visited these beaches for years too, but not so much so recently. About 30 years ago I remember being with my ex husband driving along the beach at night and there was a car stuck in the mud. Do they still allow driving on the beach down the far end at Weston-Super-Mare? I bet they've stopped it at night time, it was so dangerous. Thank you. I'm not sure if cars are still meant to park on the beach at Weston, but I think they do. Just last month, three cars got stuck at Brean, where the tide came in, I always think it must be a nightmare for the owners, and a very costly mistake! Oh gosh! How scary. I'm so glad he managed to escape unharmed.